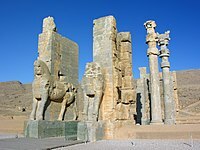 The Qajar Empire, also referred to as Qajar Iran, officially the Sublime State of Persia (Persian: دولت علیّه ایران‎ Dowlat-e Aliyye Iran), was the state ruled by the Qajar dynasty ( listen (help·info); Persian: سلسله قاجار‎ Selsele-ye Qājār;[a] Azerbaijani: قاجارلر‎ Qacarlar), an Iranian royal dynasty of Turkic origin, specifically from the Qajar tribe, from 1789 to 1925. 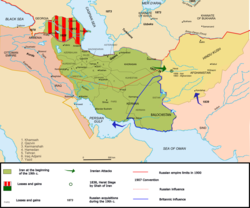 The Qajar family took full control of Iran in 1794, deposing Lotf 'Ali Khan, the last Shah of the Zand dynasty, and re-asserted Iranian sovereignty over large parts of the Caucasus. In 1796, Mohammad Khan Qajar seized Mashhad with ease, putting an end to the Afsharid dynasty, and Mohammad Khan was formally crowned as Shah after his punitive campaign against Iran's Georgian subjects. In the Caucasus, the Qajar dynasty permanently lost many of Iran's integral areas to the Russians over the course of the 19th century, comprising modern-day Georgia, Dagestan, Azerbaijan and Armenia. 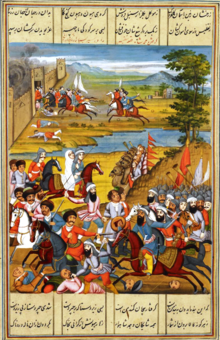 The Battle of Krtsanisi was fought between the Qajar Persia and the Georgian armies of the Kingdom of Kartli-Kakheti and Kingdom of Imereti at the place of Krtsanisi near Tbilisi, Georgia, from September 8 to September 11, 1795, as part of Qajar Emperor Agha Mohammad Khan Qajar's war in response to King Heraclius II of Georgia’s alliance with the Russian Empire. 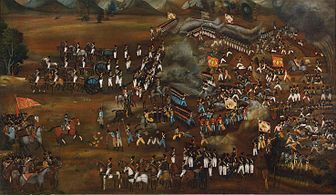 The battle resulted in the decisive defeat of the Georgians, capture, and complete destruction of their capital Tbilisi, as well as the temporary absorption of eastern parts of Georgia into the Iranian Empire. The Erivan Khanate, also known as Chokhur-e Sa'd, was a khanate that was established in Afsharid Iran in the eighteenth century. It covered an area of roughly 19,500 km2, and corresponded to most of present-day central Armenia, of the Iğdır Province, Kağızman district of the Kars Province of present-day Turkey and the Sharur and Sadarak districts of the Nakhchivan Autonomous Republic of the present-day Azerbaijan Republic. Donboli are a Turkic-speaking sub-ethnic group of Kurds originality in the Khoy khanate and Tabriz khanate regions of West Azarbaijan Province of Iran. Western Azerbaijan is an irredentist political concept that is used in the Republic of Azerbaijan mostly to refer to the territory of the Republic of Armenia. Azerbaijani statements claim that the territory of the modern Armenian republic were lands that once belonged to Azerbaijanis. Its claims are primarily hinged over the contention that the current Armenian territory was under the rule of various Turkic tribes, empires and khanates from the late medieval period until the Treaty of Turkmenchay signed after the Russo-Persian War of 1826–1828. The concept has received official sanction by the government of Azerbaijan, and has been used by its current president, Ilham Aliyev, who has repeatedly stated that the territory of Armenia is a part of "ancient Turk and Azerbaijani land." Mirza Kadym Irevani was an Azerbaijani ornamentalist artist and portraitist, who mostly created "typical Persian miniatures and lacquers".